Lately, I’ve found that working with my horses at liberty has been of great value to me in my training goals. 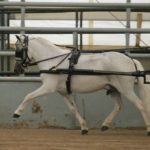 When I say that, I don’t mean the liberty class that is common at Miniature Horse (and other breed) shows, where a horse is chased around an arena while music plays. That form of liberty isn’t really my cup of tea – except when a horse really loves it, those can be fun to watch. 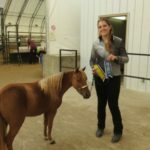 What I mean is simply working with my horses without a halter or lead rope – they are “at liberty” to participate or not, and their willingness to play depends a lot on how I present things to them. 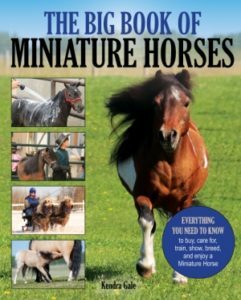 I think Miniature Horses, in particular, live their lives being “made” to do things. 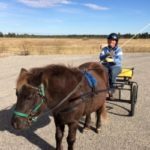 Even mine, with me constantly preaching that we should never manhandle our Miniature Horses, still probably find themselves tugged from point A to point B more than I intend for them to. Removing the halter, and with it any possibility of force – intentional or accidental – has made me a better trainer. I have to find other ways to explain what I want, and work with my horse as a partner. But that’s more the reasons I chose to take the halter off. What’s interesting, is what I’ve noticed about my horse’s responses. They’re less fearful. Without any restriction on their movement, they’re braver. They know they can always run off if they need to, so they seem to need to run off less often. They’re more curious. What I’m doing is way more fun when they don’t have to participate. Because it’s their choice, they’re more invested, and seem to learn more quickly. 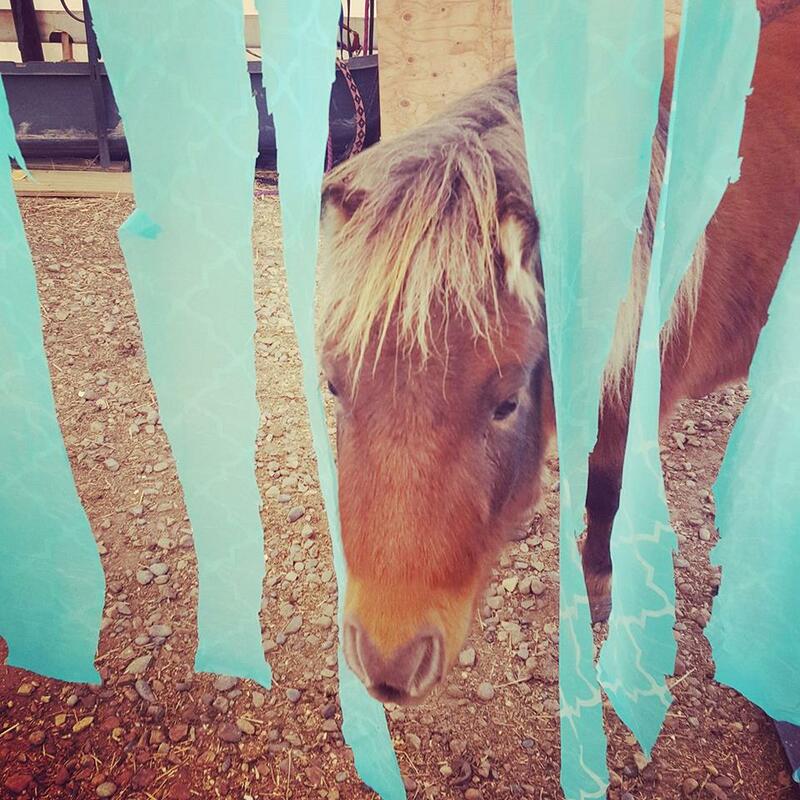 The other day, both my yearlings walked over a tarp, under the curtain, and through the tunnel and scary corner of this month’s agility course, all without a halter, on their very first attempts. While they are a sensible pair, I can’t imagine I would have gotten those kinds of results with traditional, pressure based training. I also love that it gives them a voice. I had a horse here who was having some serious issues while driving. I felt his issues stemmed from anxiety with the cart, so began by working with him at liberty in the same space as the cart. He was following me around happily, looking for a treat, but when I picked up the shafts of the cart he turned on his heel and walked determinedly to the gate. He did NOT want to play with the cart, and since he was free, was able to communicate that to me quite clearly. He did progress to touching the cart, walking under the shafts, and eventually, with a lot of time and patience, got comfortable enough to stand between them. My little mule, Bentley, has been working lots at liberty, learning to back, sidepass, and walk and trot with me, skills that he is then able to perform on a halter with confidence. When I tried to bring him into the barn, he was concerned, and he really worried that I was going to drag him in, despite my best efforts to avoid pulling on him. I removed the halter, as he was just pulling me around and not even trying, and as soon as I did, he walked right into the barn. If he has a choice, he’ll nearly always choose to do what I ask him to. If he feels like I’m not giving him choices, then all I get from him is an emphatic NO. I’m sure once he’s exposed to more things, and realizes that I don’t ask him to do things that are scary or dangerous, he’ll be more confident and comfortable. For now though, I don’t think there is any way I would have made as much progress with him as I have without doing it at liberty and making it clear to him that it’s his choice to play … or not. Here’s my challenge to you: close the gate and take the halter off, and see what you can accomplish when you have to find other ways to communicate with your horse. 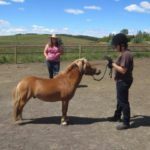 Let me know your experiences working your Miniature Horse at liberty! Terrific article, Kendra. Gives me more to think about when I’m planning my training strategy. I discovered something about little Bunny that really made me say ‘hmmmm.’ She is very opinionated, and when I took on the training of her and her roommate Butterscotch a couple years ago, she quickly got the name “Psycho Bunny” and “Killer Rabbit.” She ran from me, tossed her head, and liked to charge me while roundpenning (in the square corral because I couldn’t catch her). I spent a lot of time thinking about her, and how to connect with her, and how to start the conversation between us. We progressed to being able to halter her, but I noticed she was very stiff when I got near her. Like she would freeze, expecting something bad to happen. She willingly moved out when asked, and tried to do what I would ask, but she always gave me the impression that she was expecting something awful to happen to her at any moment. She didn’t like me ‘towering’ over her. So I began to train her online while I was on my knees. Once we were eye to eye, she relaxed. As soon as I stood up, she would brace and step backward. Broke my heart. Fast forward a couple years, and we were in the arena. She was 30 feet away from me, but watching me intently. Just for fun, I asked her to move her feet in a certain direction (sent her to the right), and she willingly moved out at the trot. Then I asked her to step up on the platform, and I’m all the way across the arena. I nearly lost my teeth when she marched right over and got on the platform. She looked at me and said ‘Ta Dah!’ So we’ve been working together with that premise: she’s at liberty, all the way across the arena, and I ask her to do something. She has the choice, and it seems to be really working for her. Maybe I should call it ‘Distance Liberty Training.’ I dunno, but it’s clear to me that the large distance between us gives her comfort, and she’s happy to engage if she knows she can just walk away. She’s certainly challenged me in all kinds of ways! Butterscotch, on the other hand, cannot get close enough to me, and would prefer to be in my pants pocket at all times. Completely the opposite of Bunny.